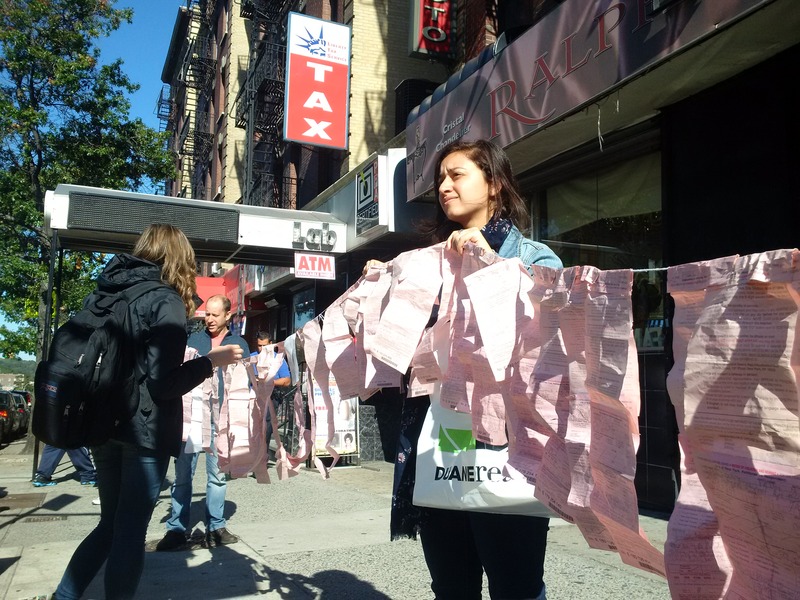 A couple dozen street vendors marched down Broadway in Washington Heights Thursday afternoon to demand an end to ticketing for vending without a permit and cart confiscation by city police until more permits become available. The protest came after the New York City Department of Health confiscated the juice cart of Vendy Award finalist Hector Palaguachi and fined him $2,000 for vending without a permit. Street vendors must have a license, which includes a photo ID badge, to run a food-selling business from a pushcart or truck, according to the city’s regulations. Palaguachi, 50, was one of the protesters in the march. He urged the city to provide more permits to street vendors. “We need permits to work better,” he said. After being ticketed, Palaguachi is now back on the street selling juices from the cart without a permit again. “I have no choice,” he said. “I have a rent to pay. I have a family to feed,” adding that he has two children age 15 and 10. Matthew Shapiro, staff attorney of Street Vendor Project, the organizer of this march, said some food street vendors who are not able to get permits from the city sometimes obtain them on the black market. He said if the city gave out more permits, everyone would be better off. “So vendors could get their permits from the city, the city could keep track of who are out there, the city could regulate,” Shapiro said. But not every store owner likes the idea of allowing more vendors on the street. Rhonie Luciano, 22, the manager of a cell phone store on St. Nicolas Avenue, complained about the street vendors hurting his business, especially the one outside his store. Luciano said street vendors do not have to pay rent, so they can sell the same product at a cheaper price. He urged the city to step up efforts to crack down on illegal street vendors.